This soap looks like it was difficult to make but is actually very easy; and customers will love it. The scent is very appealing! It has that just before it rains wonderful smell with additional notes of orange and rose. This also makes a great party favor for “It’s a Boy!” get-togethers. You Save $17.40 by purchasing this kit rather than buying the items separately. COMMENTS: This is my first project making soap and it was very easy. I had great results from the product. "Does this kit really come with a 24 lb block of both base?" Staff Answer No, Anthony, it does not. The products were coded incorrectly. The kit contains 4 lbs. of each soap base. Thank you for letting us know about this and it has been corrected. "What kind of lather does this soap produce? 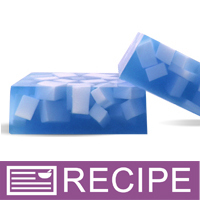 If I want my soap to have LOTS of bubbles, what can I add in to get that affect?" Staff Answer This soap has our standard bubbly lather of our MP Soap Bases. The best way to improve lather is to make sure you have not done anything to take away lather. Do not add butters or fixed oils as these will remain unsaponified and cut the lather.